Cobb salad is a classic that's open to interpretation. I've seen a lot of variations of it over the years, particularly with regard to the meats (turkey, chicken, bacon or some combination). Last year, I made a modernized version with a fresher combination of ingredients. This year, I'm offering this spring-themed version that uses fresh asparagus instead of of avocado and complements its bright flavor with scallions and goat cheese instead of the typical blue. 1. Hard-cook the eggs: place the eggs in a medium sauce pan and cover with cold water until there is an inch of water above the eggs. Heat over medium-high heat until the water boils. Immediately remove pan from heat, cover and let sit for 10 minutes. Then place eggs in ice water for 5 minutes (this makes them easier to peel). Carefully crack eggs all over, roll gently on a hard surface, and then use your hands to remove the shell, starting at the less-pointy end. Rinse the peeled eggs and slice into fourths. 2. Cook the bacon over medium heat until browned and crisp. Transfer to a paper-towel-lined plate. 3. Cook the asparagus: fill a large saucepan about halfway, salt the water and bring to a boil. Drop in the asparagus and cook for about 2-3 minutes until tender but still crisp. Remove asparagus from water once cooked. 4. 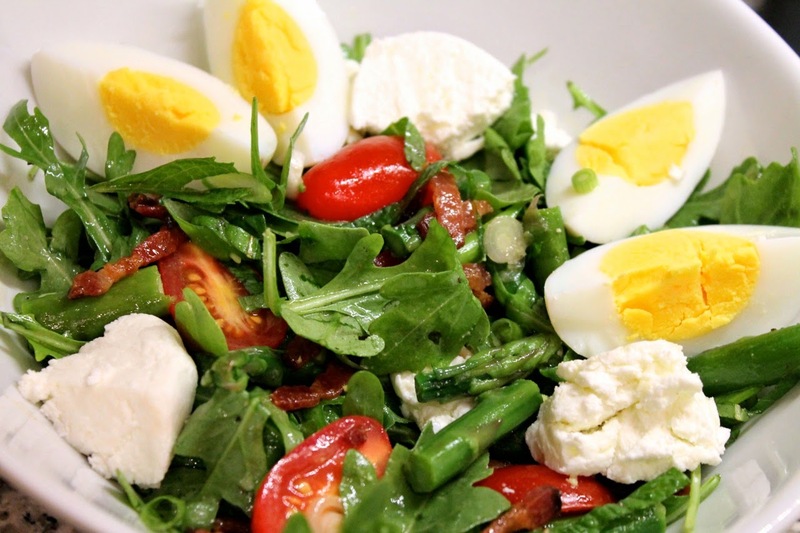 Combine the arugula, scallions, mint, bacon and asparagus in a large bowl. Whisk together the olive oil, lemon juice, honey, salt and pepper and pour over the salad. Toss to combine. Divide into bowls and serve topped with hard-cooked eggs and goat cheese crumbles. A very fine spring salad!